Installation of the program occurs in automatic way on an activation of the setup file. The program is activated by entering the license code issued by the supplier. The menu of settings is shown in the right part of the interface of the program. First of all, the value of DPI parameter shall be entered. You'll must to get to know the precise value of it for the used printing equipment. For offset printing and flexography, it usually varies between 2000 and 5000. For digital printing it is no less than 600. Then set the output format - 1 bit/8 bit. This parameter depends on the method of printing as well. For offset printing, flexography and laser printers it equals to 1 bit. For digital printing and inkjet printers it equals to 8 bit. Some digital printing machines can print with a higher resolution in the mode of 1 bit - this mode is more preferable. Some digital printing machines can print in the modes of 4 bit or 6 bit - for such machines, the setting of 8 bit is used. Then select the value of LPI from the offered list. The higher resolution of the printing equipment allows setting a higher value of LPI. The optimum value for obtaining the effect that "expresses itself on copying the image" is 100-150 LPI. Then the test for determination of the optimum combinations of gradients shall be printed (the button "Generate test"). Generation of the test may take from some minute to one hour dependently on the set parameters and the operating speed of the computer. Usual works will be generated much more rapidly. The generated file of the test shall be printed according to the instructions provided in the chapter "Printing". For printing, sheets of A4 format are required. The test enables choosing the required intensity of colour and combination of gradients that ensures invisibility of the latent image. The printed test includes nine columns differing in tone colours. Each column is filled with small squares placed chequerwise. The positions where the tone colours of squares are the same and visually indiscernible shall be marked. If the set value of LPI was too high for the specific printing machine, the quality of printing of lighter columns may be poor. Parameter G1 (gradient #1) identifies the intensity of colour, and parameter G2 (gradient #2) is chosen according to the results of the test. 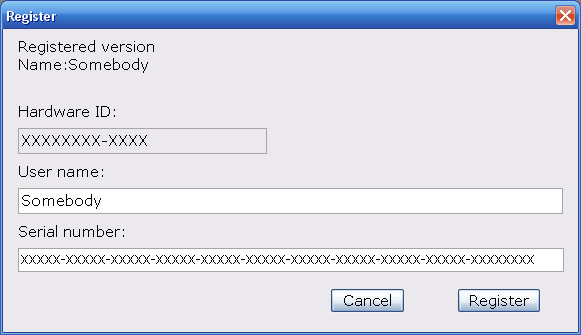 The chosen combination of the gradients should be specified in the menu of the settings of the program. In the technical aspect, the optimum value of G1 is 35%. Parameter G2 can be specified with 0.1 percent accuracy, for example, 31.2. The button "Save settings" saves all entered parameters of settings. The button "Save settings as" saves parameters of settings under a new name. All saved settings may be called from the list in the upper part of the menu. The button "Delete settings" deletes the current version of the settings from the list. For generation of the background, its layout with a latent image shall be developed. The format of the file - TIF image, the colour model - Grayscale, and the recommended resolution is 300 ppi. The file should be free of supplemental layers and compression. Let's suppose that you need 10x15 cm background. Create a new image of the same size in any graphics editor. Choose the white colour for the background. On the background, place black inscriptions or other images to be toned on copying. Use the black and white colours only. Save your image. If a document is to be printed by an office printer or another printing machine of a low resolution, a white text on the black background should be chosen. Press the button "Open image" and load the prepared layout with the latent image. The image also can be transferred to the operational field of the program by the mouse. The loaded image will appear in the preview without halftones, i.e. identical to the latent image to be toned. Choose the required version from the list of saved settings. Press the button "Generate background" and specify the name of the file under saving. Wait until the completion of generation of image. If you have any questions about GuardSoft AntiCopy PRO, please e-mail us.